Runaways Season 2 dropped towards the end of last year and I finally got a chance to finish it. I was a huge fan of season 1 and thought that they did justice to the source material. All of the main cast returns for this one and if you haven’t seen it yet, it is available on Hulu in the US. One of the aspects of the show that has improved is the character dynamics. Most of last season was setting up the entire group but this season took it to the next level. We got to see how the Runaways interact as a group. Seeing the differences between the characters and how it impacts the way they live was really well done. The most effective in my opinion was between Alex and Chase. Both characters have extremely differing viewpoints on them running away and seeing that conflict develop over the season was fascinating to me. A lot of the old and new romantic relationships were also fleshed out. All of the actors have good chemistry with each other. As a fan of the comic, I felt that the show did a much better job actually giving the parents characters. The show makes an effort to actually humanise the characters and I find that a lot more compelling than stereotypically evil villains. Dale and Stacey were again highlights when it came to comedy. However, Janet was the star for me. The writing for her character made her a lot more interesting than she was last season and now, she’s one of my favourite parents. Honestly, the only character I had an issue with was Molly. Throughout the first half, the character comes off as annoying. I don’t think the actress was doing a good job. However, her acting did get better and towards the end her character became a lot more bearable. Not all of it is down to the performance. Part of the reason for the poor performance is the inconsistent dialogue. It isn’t always a problem but sometimes the Runaways writers seem to forget how to write and throw in some terrible dialogue. This became extremely obvious towards the end where there were several forced Fortnite and GTA references. These felt extremely out of place and were laughably bad. Despite having flaws with dialogue, the script was good when it came to the actual story. After how season 1 ended, there were several different ways to take the story and I am satisfied with the direction they went. Unlike season 1, this season wasn’t forced to set up a lot and this led to a much better and faster pace. Even though the show was better paced than season 1, there are a couple of episodes in the middle where the show loses its sense of urgency. Something happens in episode 7 which is a huge surprise. Because of it, the show loses a sense of purpose between this and episode 10. It isn’t boring at all. In fact, most of it is still pretty good. However, it doesn’t feel as strong as the first half of Runaways season 2. Some of the standout episodes to me were the 7th and the finale. The 7th episode is full of action packed moments and has a shocking twist towards the end. It also wraps up a couple of the arcs and sets up the show for the second half of the season. The other brilliant episode was the finale. Towards the end of episode 12, I wasn’t exactly sure which direction the show was going. The finale has several fascinating twists and sets up season 3 brilliantly. I won’t spoil how it ends but I am now extremely excited for next season. Another minor nitpick I had with the show was the occasional slow motion. It ruined some emotional moments in some of the episodes and hopefully they use it in a more effective manner next season. Thankfully, most of the cinematography and colour grading is great and the dinosaur looks pretty good for a TV budget. The show’s soundtrack was mostly average but there were points where it became distracting and took me out of the scene. Overall, Runaways season 2 improves on the characters and story set up by the first season. The performances got better as the season progressed. 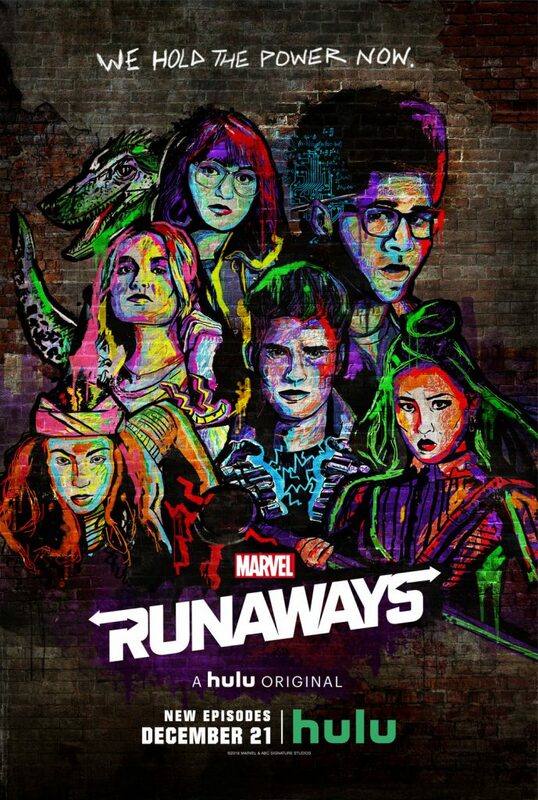 Some of the dialogue is off and certain technical aspects are weak but the second season of Runaways is a solid step forward for the show and sets up a potentially exciting third season.